Recently I had to connect o a WebSphere service using BizTalk. The service required a client cetificate for transport authentication but also a username/password in the soap envelope. Ok, this might be considered as overdoing the security, both requirements authenticating the client, but it did not sound too strange to me and I thought BizTalk with WCF would probably handle that out of the box without any problems. Well.. turned out I was wrong and it wasn’t an easy nut to crack for me so I’ll blog it for the masses. Transport Transport level authentication provider. Comparable to the IIS settings, eabling you to set None (no authentication), Basic, Digest, Ntlm, Windows or Certificate (encryption) authentication. This option requires that you use HTTPS. Message Enables Authenticaton in the SOAP header. Offers using a username / password or certificate (signing), In this case, the certificae will be used as a signature over the the soap message and not for transport level encryption. Because this option is for HTTP transport only, WCF does not permi the usage of the usernam/passowrd option. TransportCredentialOnly Similar to Transport, but allows you to send unencrypted passwords over HTTP. Good for testing without certificates, but not meant for production purposes. Basically, these are the samen options you use when using WCF in a C# project. 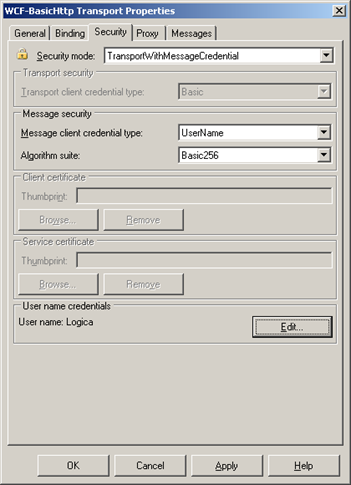 In theory, you would use Transport with Message Credential, but the BizTalk Interface does not give you the opportunity to use a client certificate.. So it’s not just me.. it’s official. 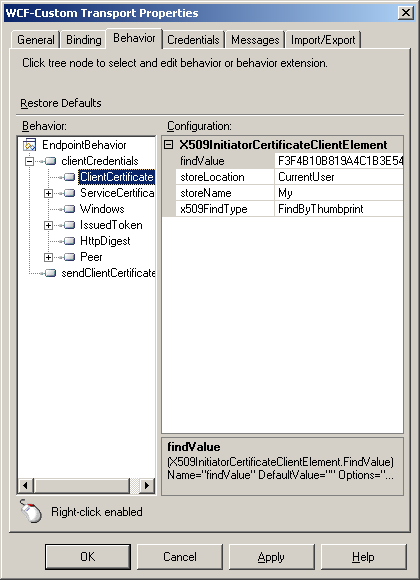 // necessary to enable client certificates over BasicHttpBinding. Now this worked in WCF using a ‘normal’ C# project and some custom code. But this being a BizTalk solution, I needed to be able specify this all in configuration. The regular way to do this, is by using a custom behavior in WCF. A custom behavior is not that hard to create. You just create a new c# project, with a main class (I named “SendClientCertificateBehavior”) that derives from both System.Attribute and System.ServiceModel.Description.IEndpointBehavior. Use the right mouse button to implement the interface and add the code to the “ApplyClientBehavior” behavior (in this case). Use the endpoint as provided in the method parameters. Under ‘clientcredentials’ we can add the certificate information, in my case a thumbprint of a certificate that is in the CurrentUser section. In the credentials tab, you can then add username and password. So.. in the end it IS fully configurable. Just needs a lot of work up front.